Check Out the New Ford Transit Connect Technology Features | Donley Ford Lincoln of Mt. 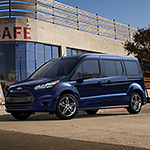 Vernon Inc.
Technology features make the Ford Transit Connect cargo and passenger wagon so popular. The Ford Transit Connect has the Cross-Traffic Alert feature helping to give you a better look behind your vehicle when driving in reverse. The radar will scan both sides for any oncoming traffic that could get into your path and will alert you to stop until the vehicle has moved on and the coast is now clear. One of the unique features that come in the new Ford Transit Connect will help to avoid a rear-end collision. The Pre-Collision Assist utilizes a camera to scan the road and will flash several alerts to the driver so there is time to stop. if the alerts are ignored, the brakes are pre-charged to bring the vehicle to a stop. Take the new Ford Transit Connect on a test drive today when you come to see us here at Donley Ford Lincoln of Mt. Vernon Inc.